A friend shared that on Pinterest. “18 Days till the Alpacalypse” It made my funny board on Pinterest. At first I did not get it. I thought it said “18 days till the Apocalypse” which is not all that funny. I thought there were a bunch of llamas on the photo that said “18 Days to the Apocalypse” and I wondered why? The end of the world being December 21 or 22, 2012 is a Mayan calendar thing. I wondered if Llamas were from that part of the world. Then I realized the photo says Alpacalypse not Apocalypse. I met an Ohio alpaca* farmer on the streets of Worthington. Her sweater (which I assumed from the back was a jumper) caught my eye. 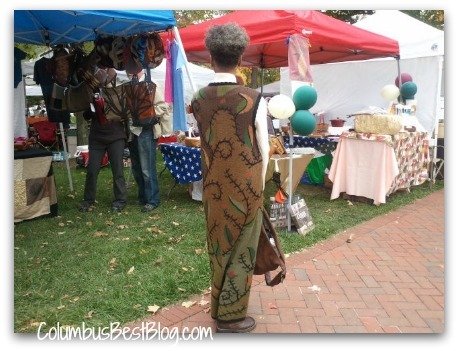 We were both at the Fall Festival in Worthington, lots of crafts at booths around us. I’d browsed purses, scarves, hats, jewelery… when her clothing caught my eye. I said something stupid like “Hey where DID you find that dress?” When she turned around I could see it was a long sweater vest rather than a jumper. Duh! We carried on a conversation. She did not make the sweater but the yarn came from her alpacas. She is from Lucasville (southern Ohio) and she raises alpacas. She has a herd of five now but wants to roughly quadruple that. She said they raise the alpacas for color. Is it a lama or alpaca? The Ohio alpaca farmer gave me her business card. She allowed me to photograph her backside. Her outfit was great, all color coördinated, the sweater had great details on the front but I wanted a photograph of the back of her sweater. She is Sheila Jones according to her business card. 21 Nation Alpaca is the name of her business. She wants to increase her alpaca herd to 21! She told me that! 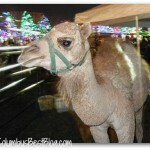 There was a petting zoo at Columbus Commons for their Holiday Fair last weekend. Sheep and goats, a zebra, a camel and llamalike things. Perhaps they were alpacas. The end of the world as we know it? 18 Days till the Alpacalypse! Oh my! These alpacas are so cute! I haven’t seen one so far in actual sense that’s why I’m so interested in seeing one. Thanks for sharing this wonderful post! Seriously? The link to the spam page about alpacas was removed from the comment. Previous post: New Albany is Missing! Next post: Tonight Worthington or Powell?